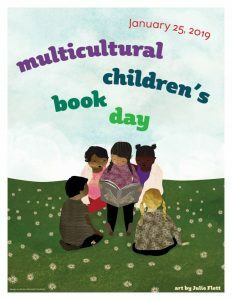 I’m always happy to welcome a new picture book with an original take on the holiday into the mix of Passover stories. 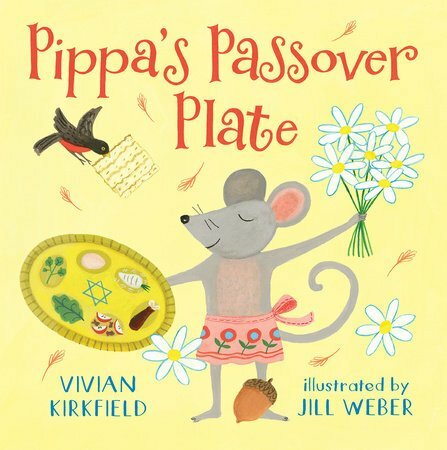 Today I’m reviewing Vivian Kirkfield’s charming Pippa’s Passover Plate with illustrations by Jill Weber so you’ll have time to pick up a copy to read before and during your family’s upcoming Seders. 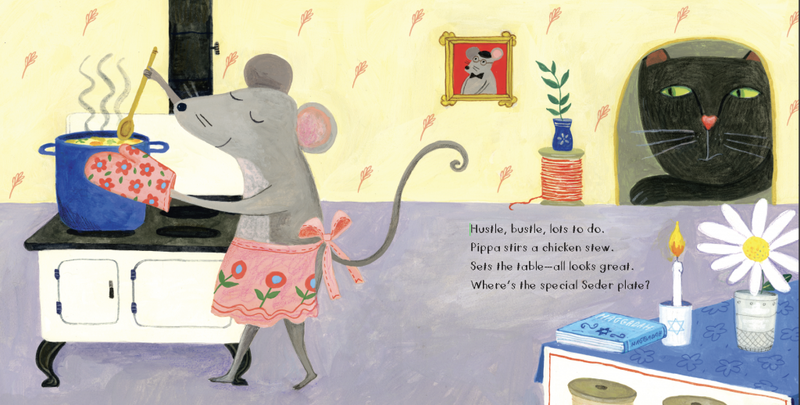 The premise of this read aloud tale told in rhyme is that Pippa the mouse cannot locate her Seder plate, a plausible predicament even for humans! The pressure’s on because this concerned pip squeak must find the plate before sundown and the start of her Seder (the traditional annual ritual where people of Jewish faith gather with friends and family to eat, read, share stories and celebrate the liberation of the Israelites from slavery in ancient Egypt). Interior spread from Pippa’s Passover Plate written by Vivian Kirkfield with illustrations by Jill Weber, Holiday House ©2019. … adds to the page turn appeal of the story since the little mouse must face her fears in order to find the missing plate. Her potential predators, however, don’t seem to want to do her harm. When Owl wisely suggests that Pippa “question Golda Fish” (great name btw), it seems an easier, less scary task to undertake. Weber’s wonderful artwork here in addition to elsewhere in the book complements the text where Golda is described as quite enchanted with herself. Since a mirror isn’t available, a brass Seder plate in which she can admire her reflection is apparently the next best thing. I love Weber’s palate of all shades of yellow, a cheerful color to counter any feelings of danger when Pippa meets Sphinx, Snake and Owl. How the plate landed in the lake is up for debate so why not ask your child? I’m sure they’ll spin some wild tales. The good news is that Pippa can now prepare the Seder. 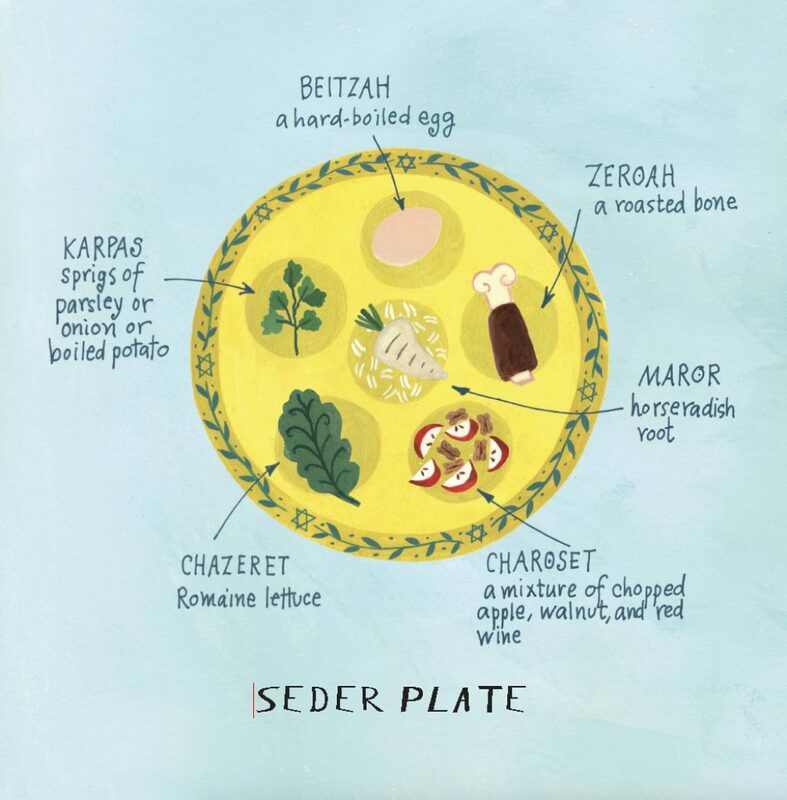 No longer fearful of the animals, Pippa invites them all to her Seder and the story ends with a frame-worthy illustration of the Seder plate, and the special food that goes on it. I do wish there had been one page of back matter that included a description of what each of the six food items represents in relation to Passover. 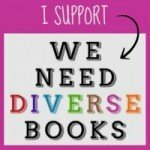 Nonetheless that’s easily found online and the majority of readers will know and can explain that to their children. For teachers planning to read Pippa’s Passover Plate to a class, I recommend having this information on hand for inquiring minds. It also couldn’t hurt to include info on what matzo is and why a piece of it gets hidden during the Seder since it’s mentioned on the second to last page when the friends are gathered together to celebrate the holiday. Interior artwork from Pippa’s Passover Plate written by Vivian Kirkfield with illustrations by Jill Weber, Holiday House ©2019. I recommend this adorable picture book which provides the perfect opportunity to discuss Passover traditions, especially for little ones ages 3-6 who will find Pippa’s plight engaging and most enjoyable. Happy Passover! Find a Passover book review from last year by clicking here. 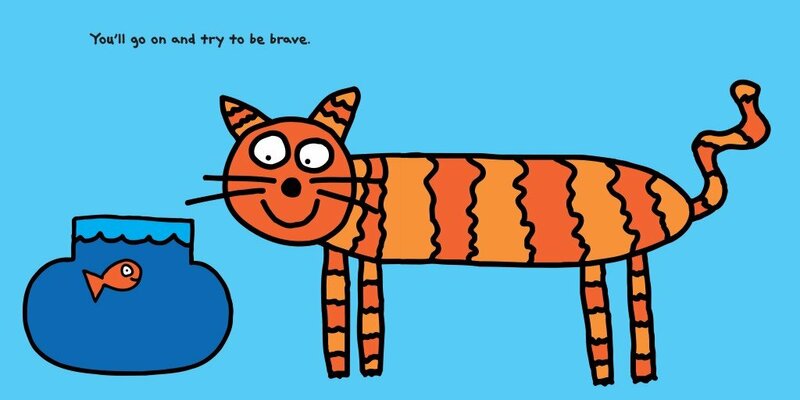 The Goodbye Book written and illustrated by Todd Parr, Little, Brown Books for Young Readers ©2015. 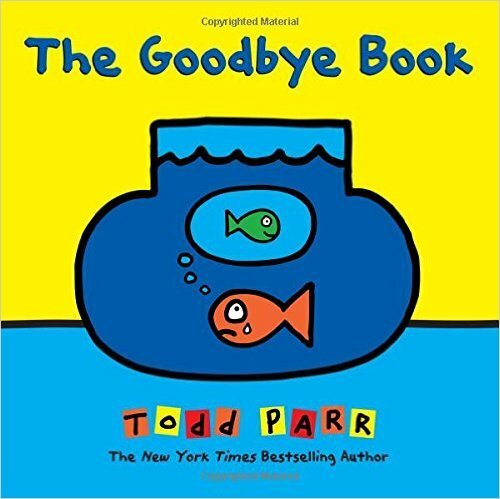 Todd Parr, with his signature bold and bright style, gently approaches one of the toughest experiences of life with hope and the assurance of healing in The Goodbye Book. Saying goodbye is never easy and sorting out the myriad emotions that arise from such an experience can seem impossible. At first glance, I felt Parr’s touching book was simply making the “7 stages of grief” more accessible to children, but, in fact, the book deals with the issue of loss in a more in-depth and complex manner. Interior artwork from The Goodbye Book written and illustrated by Todd Parr, Little, Brown Books for Young Readers ©2015. Parr establishes a safe distance for children to relate to such scary feelings through his main character, the goldfish. As readers, we immediately sense the feeling of sadness after the goldfish is separated from his friend. Supporting characters, a girl and black & white dog, are also grieving. Through the simplicity of their expressions, you can feel a multitude of emotions; they don’t merely look sad but confused and even emotionally numb. At the same time, it’s important to note- herein lies the beginning of healing because the sadness is shared among friends. But the pain of the loss is very fresh in the fish’s heart, so the range of emotions is wide: “You might be very sad. You might be very mad. You might not feel like talking to anyone.” Your daily activities, like eating and sleeping, may be interrupted. 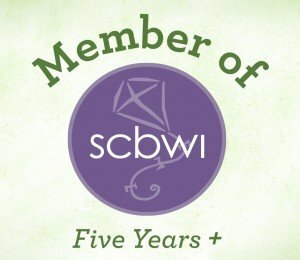 You may also withdraw from activities you once enjoyed, like going to a birthday party. When you’re grieving doesn’t it seem everybody else is happy and living a perfect life? The celebration makes your sadness even more painful, and you think you’ll never be able to experience that kind of joy again. So when the goldfish drops the party hat and swims away from the party, we know exactly what he’s feeling. The most touching page for me is when the fish sets a table for two “pretend[ing] it didn’t happen.” The expression on his face is heart wrenching, but through his sadness we readers realize–the fish is beginning to accept what has happened. Through the passage of time and the memories of good times shared he “eventually …start[s] to feel better.” We see positive changes in our fish’s behavior. We see him reaching out to someone, talking to his friend, the dog, and expressing his feelings through drawing. Most importantly, our hero’s actions show us there are things we can do to help with the coping process. We need not feel ashamed of our feelings and can open up whenever we’re ready. The Goodbye Book can be used by parents and educators alike to talk about the spectrum of loss: from leaving behind a friend or relative who lives far away to the final farewell we experience when a loved one dies. As Parr shows us, healing is not a linear path from grief to happiness; acceptance takes time. In the end, the assurance of love is all we need to cope and recover. We find comfort in knowing that someone we love will be there to listen to us and hold us. A gentle and loving approach to the tough subject of loss, Todd Parr’s The Goodbye Book is ideal for healing hearts. Poor Doreen: A Fishy Tale written by Sally Lloyd-Jones and illustrated by Alexandra Boiger, Schwartz & Wade, 2014. Anyone who has ever gone fishing or known someone who has, has told, or been told, a fishing tale. An eight inch long fish becomes two feet long, and we’ve all heard of the big fish that got away. In Poor Doreen: A Fishy Tale by Sally Lloyd-Jones and illustrated by Alexandra Boiger, (Schwartz & Wade Books 2014, $17.99, Ages 4-8), Mrs. Doreen Randolph-Potts has a fish tale to tell of her own, only hers is true! A myriad of fish look on sympathetically, as the narrator bemoans Doreen’s bad luck. And it’s not a treat. And the one thing you’re not is lucky. Parents, and fish afficianados, don’t fret. By hook or by crook, Doreen makes her way to her reunion with her second cousin twice removed, and her 157 babies, unharmed. This is a perfect cautionary story. It allows the reader to see the dangers Doreen faces for themselves, but with a sense of lightheartedness that opens the door to deeper conversation.